Christian Marclay surely needs no introduction here. As a sound artist, Marclay made a name for himself years ago exploring the possibilities of performing with damaged records and even broken/re-assembled records. Just such a performance took place in Buffalo at Hallwall’s back in 1985. See pic below. Marclay’s endeavours are not limited to sound, however. The Swiss-born artist also works in film and even teaches Video Collage at the European Graduate School. His own skills in video collage became apparent with the release of The Clock. Check out this 3-minute excerpt. 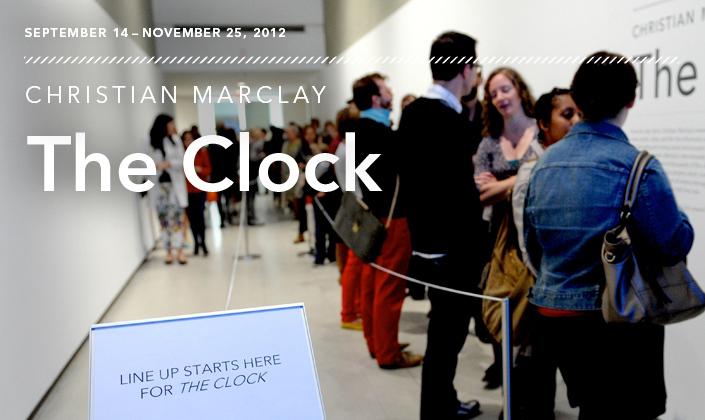 . .
And luckily The Clock is screening in Toronto at the Power Plant at select times until November 25th. See link for times.